Meet Captain Bob Priefer. Captain Bob was the last skipper to sail our ship. 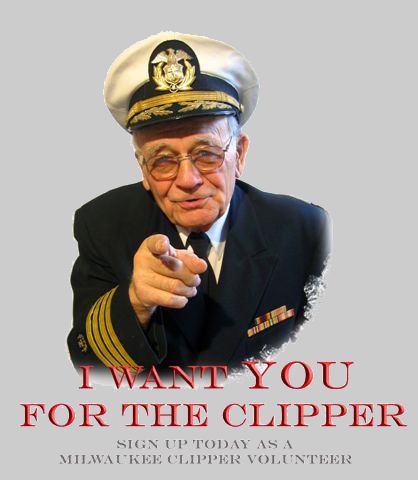 He was part of the group who worked to return the Clipper to Muskegon, and is still on the Board. As a volunteer, Captain Bob is involved in every aspect of keeping this Historical Landmark operating for your enjoyment. But he needs your help! There are many ways to get involved. We need volunteers for many areas. Local volunteers actually work on the ship maintaining and restoring it. We also have volunteers who live some distance away, and find other ways to help out. We need donations of materials for our restoration efforts, and maintainence of the ship. We also can use money! A cash donation is deductable as we are a 501 (c)(3) tax-exempt non-profit organization that is funded by tax-deductible gifts from individuals, grants, and businesses.